It's well known in the motorcycle industry that if you have something chrome plated you're going to have work on it to get it to fit right again. We do what most other chromers will not take the time to do. Before any product leaves our shop it's inspected for defects, checked for tolerances and fitments. No hassles for you because we take the time to mask the bearing, rotor, and pulley mating surfaces. 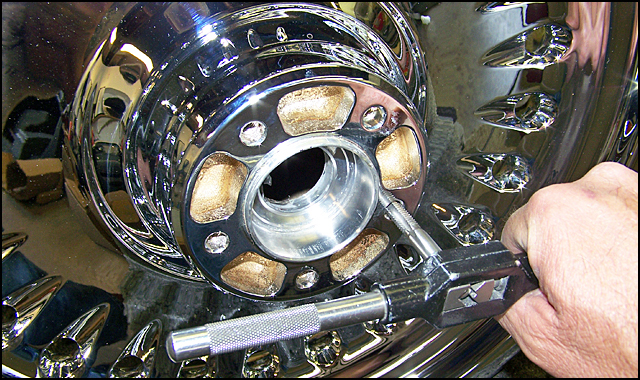 We re-tap all threaded bolt holes in wheels, forks, calipers, and anywhere else there is a threaded hole. We spin the wheels and polished rotors to check for run out ,and while we have them spinning we scuff the hub surface where the rotor attaches to help eliminate brake squeal. Our fork leg bores are cleaned and polished out and ready for installation - a real plus if you've ever installed forks from a chrome plater you know what that's like. OUR GOAL IS TO BE THE BEST IN THE BUSINESS!